is is a amazing beautifully designed durable I jewelry box. In the center of case there is a silver latch. On the latch there is buttons on each side and when you press then together it will open the box. Just like on the outside the inside had the same velvety purple texture throughout the box. The to or the box inside has 8 could to hold your necklaces. There is a purple velvet pouch for if your necklaces have a charm on them the charm while on the necklace can be placed inside the pouch for safe keeping or for them not being damaged. 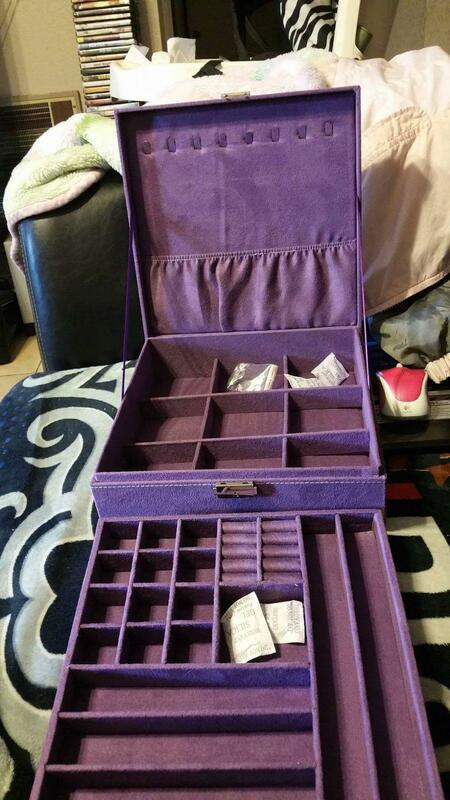 The first level of the box has 12 small divided boxes for such items as small earrings or rings ect. items like that. Then there is a space with 4 small rows that are directly ment for rings. On the lower end of this section has 2 I would say sorta deep divided horizontal boxes that could be used for bracelets of something along the size of that. Now on the right side there are 2 vertically longer divided boxes for longer bracelets, necklaces of maybe watches. Now, on to the 2nd level the first level comes out and underneath that you will find 8 medium size divided squares these are big enough for hoop earrings or your bigger jewelry that won’t fit in the spaces on the top level. Now this is very important, there is a small plastic bag that holds a key to lock the box up. Yes, it I didn’t pay attention and remove the top part of the box I would have never found it, it is that small. This would be a great gift for that special someone in your life or a gift for just about anyone. My niece and mother in law love the box, they love the texture, color and most of all that it locks. My mother in law has always wanted a lockable box as she has had people steal from her but when she checks then out, they are expensive. When she saw his the box locks and you can’t get into it she sees why they are pricey. But, when I showed her the price on amazon fit this bid she said she has to get one, try that is by far the cheapest she has seen for one that is so nice and durable. Now for the key I suggest to place it somewhere or on something so you don’t lot of it cause it you lose it you can’t get into the box unless you break the latch of know someone who can pick locks which I don’t recommend. Other then that this is beautiful I would love to get a few and give them as gifts. Disclaimer: I received this free in exchange for a honest unbiased review. I tested this looked this product over and locked my items in it personally. Everything I said in this review is true and unbiased.